A changing building market still offers great opportunities for plumbers – and copper – if you know where to look. John Fennell explains. Australia’s obsession with housing is well known, with headlines on the topic most days in every city. But all that information can make doing business fairly confusing, especially if you’re trying to work out the best place for your efforts and resources in the future. Thankfully, we have some smart people sorting out the trends for us. BIS Oxford’s latest snapshot on the building sector for the next three years makes interesting reading. Construction still seems to be booming along the east coast. However, BIS says new dwelling activity looks like easing off marginally, but not uniformly across the country. At the same time, non-dwelling construction will pick up steam. NSW and Victoria – driven by Sydney and Melbourne, naturally – will need to keep building to meet what still looks like a sizeable dwelling deficiency. Both cities are expected to add a million people by about 2027, with expectations that they will hold eight million people each by mid-century. Sydney plans on having three cities: Eastern around the current CBD, Central around Parramatta and Garden City around the yet to be built ‘aertropolis’ at Badgerys Creek. Enough building to keep demand high for some time. Such growth is not forecast for Western Australia, South Australia and Queensland. BIS says they will have enough dwellings to meet population growth for the foreseeable future. Overall, the country’s total building construction is set to grow to about $120 billion in 2018, but it will drop by 5% overall in 2019 and again by 4% in 2020. Non-residential construction will grow by 18%, 5% and 2% over the same period and will be pretty much the same in all states. The commercial boom is particularly good news for the plumbing industry and, by default, copper. Copper has achieved a dominant market share in the commercial and apartment market for a number of reasons. First and foremost, the consultants who design these buildings know that reliability, longevity and health and safety are crucial features in a major building that will house lots of tenants for 25-30 years. The recent failure of some polypropylene random copolymer, or PPR, products has reinforced the consulting industry’s preference for high-performance materials such as copper. Cost differential is less of an issue these days. With the evolution of quick-fit installation fittings such as KemPress, the cost variation between lower-value plastics and robust copper systems has been greatly reduced over the past five years. 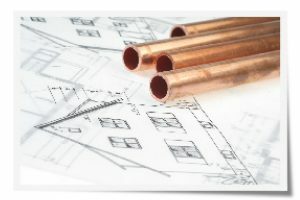 The move in recent times away from project homes to high-rise residential buildings has also encouraged plumbers, builders and consultants to use more copper in plumbing. It just works more reliably at height and across multiple dwellings. A booming building market may sound like the answer to our prayers, but it also comes with costs that need watching. Rising demand has been steadily pushing up wages and competition for workers among companies big and small. This adds a layer of stress in terms of revenue, profit and a much tougher quoting and tendering environment. Another issue is the skills shortage. A decline in apprenticeship numbers has been an issue in plumbing and other sectors for some time, but the matter is now starting to attract national attention. New graduates must be skilled at working on multi-dwelling or high-rise towers. They should have the knowledge to install high-performance plumbing and be able to work effectively in copper where necessary. The copper industry is well aware of the issues and has been working to improve the situation.